Whether you are looking to secure one door or 100 doors, adding access control can help. Protech Security will customize an access control solution to fit your needs. Having access control involves managing who has access to specific resources at any given time. 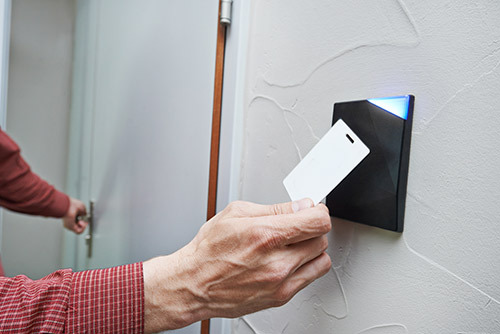 The concept of access control revolves around the process comprised of three steps: identification, authentication, and authorization. Using these three principles, a system administrator can control what resources are available to a system’s user(s). The term “identification” refers such things as user names and identification cards. It means a system user identifies who they are. This step is usually performed when logging in. ”Authentication” is the second step of the access control process. Passwords, voice recognition, and bio-metric scanners are common methods of authentication. After a system user is authenticated they are then authorized to use the system. The user is generally only authorized to use a portion of the systems resources depending on their role in the organization. Protech Security has installed and maintained access control technology in federal, state, and privately owned facilities. We will use our extensive knowledge of multiple products to find an access control solution that fits your business budget and security needs. Ask us about our financing and leasing options.